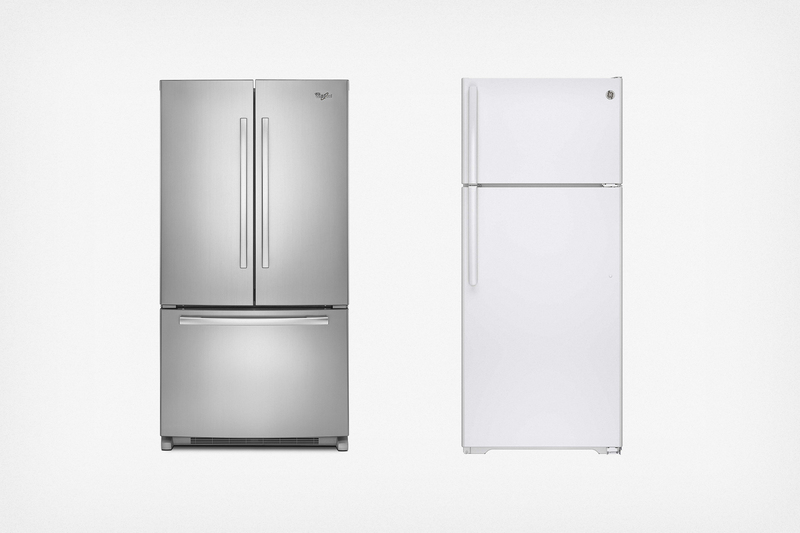 The best fridges for every budget and space. We think the best refrigerator for you is most likely the Whirlpool WRF535SMBM—a reliable, affordable, French door fridge that fits a space 36 inches wide. In addition, our 65 hours of research has shown it to be the most common size and style of fridge bought in America today. 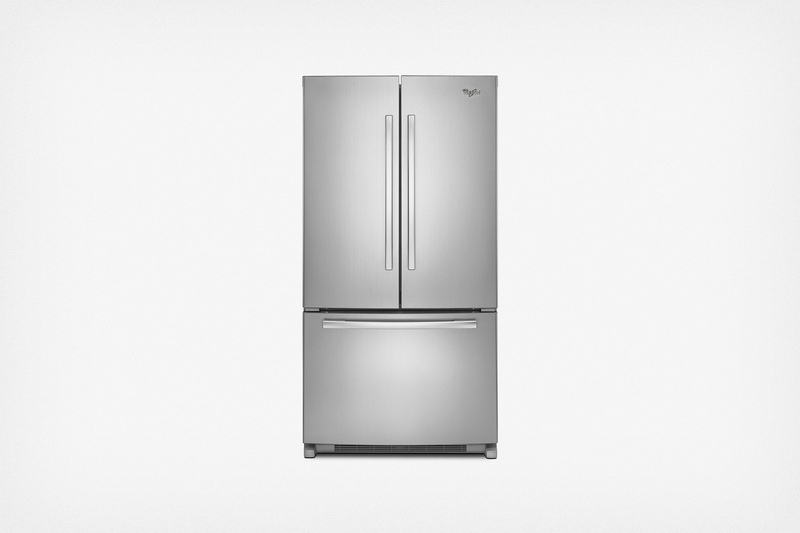 The two most popular refrigerator styles these days are French door (left) and the classic top freezer (right). Picking a fridge really boils down to personal taste because most fridges work well. Depending on your budget and the amount of space you have, you'll have dozens of fridges with different features and styles to choose from. In this guide, we recommend a few refrigerators at the most popular sizes, styles, and price points. Maybe one of them is a good fit for your home. On the other hand, you might need a narrower or shallower fridge than we recommend, or maybe you just prefer a different style. We know that we can't account for all the make-or-break factors for every kitchen and every family. If our picks don't suit you or you just want to double-check our criteria, check out the "How to buy a fridge" section in our full guide. For the specific models that we recommend, we focused on a handful of the most popular size-style-price combinations, which we gleaned from sales data provided by industry groups and manufacturers, the bestseller lists on retailers' websites, and anecdotes from salespeople and repair technicians. We only recommend models that are available from multiple national retailers, so you should be able to find any of these in your area most of the time. Because we don't have the means to test fridges on our own, we got some hands-on time by checking them out in showrooms in the Boston metro area, including Sears, Lowe's, Home Depot, and Yale Appliance + Lighting. We also considered certain details from editorial reviews, like notes about noise levels. But we mainly relied on user reviews—thousands of them—for info about reliability and other qualitative aspects of the fridges. We find that user experience, taken comprehensively, often provides the best data. 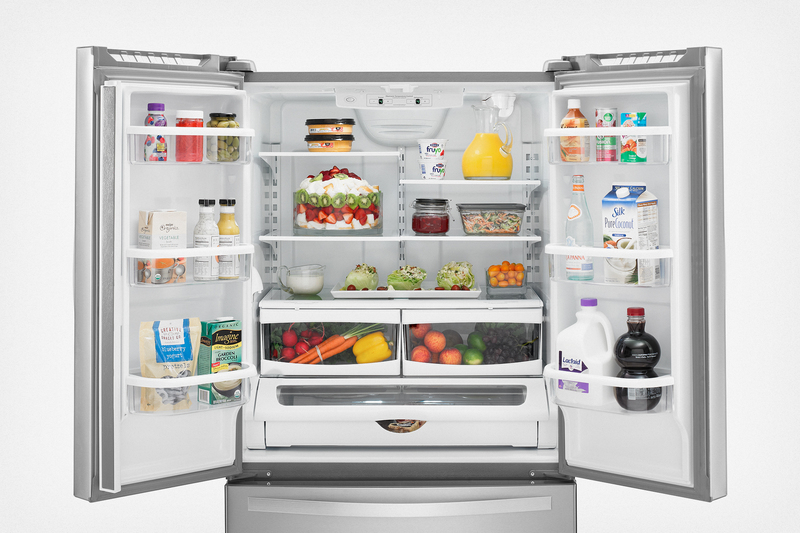 The Whirlpool WRF535SMBM is one of the most affordable French door fridges at the most popular width (36 inches). The Whirlpool WRF535SMBM's build is stripped-down but solid; it feels like it can turn in years of steady service without much fuss. (It's a newish model, so long-term data is unavailable, but it gets superior short-term reliability reviews from owners.) With about 25 cubic feet of full-width, well-distributed capacity, it should hold enough food for a family of six with room left for drinks. Energy Star gives its efficiency a stamp of approval. Noise is not a common complaint among owners, either. No fancy features other than an ice maker in the freezer, but that means fewer parts or features that can break over time. And for what it's worth, the stainless-look, French door design should keep your kitchen looking fresh and modern for years to come. We like the Samsung RF28HMEDBSR for its versatile center drawer, blue LEDs, and silver trim. 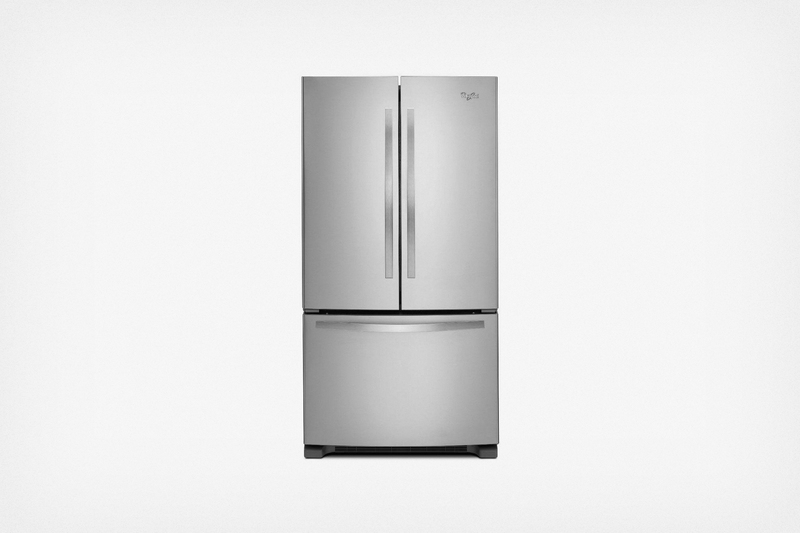 For a big kitchen with a big budget, we'd get the 36-inch-wide Samsung RF28HMEDBSR. That's because we love the four-door look, which is a newly popular variant on the typical three-door French door design. We also love all its little design flourishes, like blue-tinted LEDs and shelves with silver trim. Sure, the center drawer's "flex" temperature settings are a little gimmicky, but we'd turn it up to the warmest setting and keep our fancy beers in there. The ice maker is slow and somewhat prone to jamming, but we could live with that. Do you need to pay this much for a good refrigerator? Hell no—we just like this one. If you're going to use something every day for the next decade, you should get something you like. You should pick whatever suits your tastes, and you have plenty of great options. Our buying guide can point out the pros and cons with most of the currently popular refrigerator designs and features. Most top-freezer models are pretty similar, but the GE GTS18GTHWW is among the least likely to have reliability issues. If you're on a budget, we recommend the GE GTS18GTHWW. As a 30-inch-wide top freezer that costs less than $600, it is the most basic (in design and price), viable fridge that most people should consider. It has all the same features as similar models, and it's less likely to have a factory defect or other reliability issues, based on what we've learned from user reviews. At 17.5 cubic feet, it holds enough food for a family of four. This is also a solid pick if you're looking for a second fridge to keep in the basement or garage, or if you need to provide a refrigerator for tenants. The Whirlpool WRF532SMBx is a slimmer 33-inch version of the Whirlpool we recommend above. For 33-inch spaces, Whirlpool makes the WRF532SMBx (the last character is a "wild card" for different finishes), a model that's nearly identical to the wider Whirlpool that's our main pick. The same pros and cons that apply to the WRF535SMBM also apply to this model. One catch: 33-inch fridges aren't as in demand as 36-inch models, so prices tend to be higher despite the refrigerators being smaller. 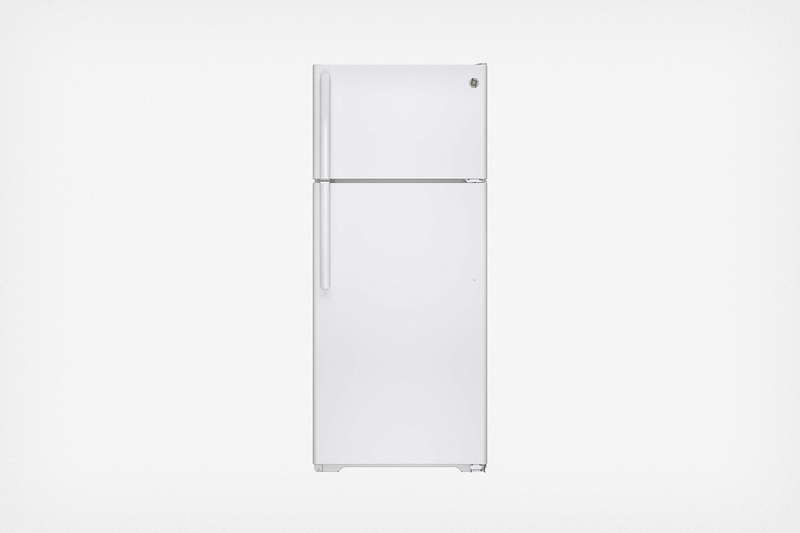 If your kitchen is small enough that you need a 30-inch fridge, the GE GTS18GTHWW we mentioned above as our affordable top-freezer pick is a good choice. We looked for a 30-inch model with a more modern look and better features, but nothing at the right price jumped out at us. 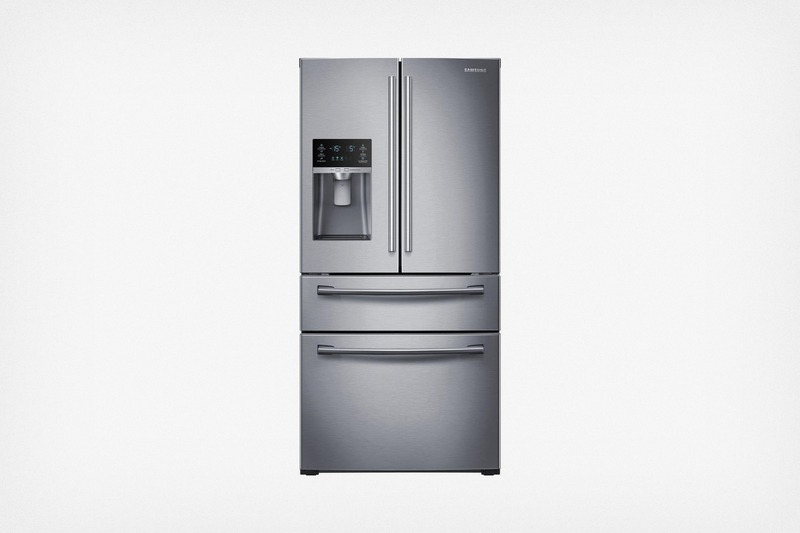 The French door fridges at this size all cost more than comparable 33- and 36-inch models, which makes the smaller models hard to justify buying. None of the bottom-freezer models felt like they were worth the $400 premium over our budget pick. And sure, you could "go in between" and get a top freezer with a stainless finish, but we'd rather you just save the money. Of course, none of that should stop you from getting a refrigerator you like. If you're working with a narrow space and want something more than a boring, cheap top freezer, our buying guide may help you find it. This guide may have been updated by The Sweethome. To see the current recommendation, please see the latest full guide.